HIV-1 replication is inhibited in uninflamed lung macrophages and is stimulated during tuberculosis. Attempts to recapitulate activation of HIV-1 replication in primary monocytes and macrophages ex vivo and in the untreated and PMA-treated THP-1 cell line model in vitro have produced opposite results depending on the state of differentiation of the cells. After infection with Mycobacterium tuberculosis, monocytes enhanced HIV-1 replication and produced a stimulatory 37-kDa CCAAT/enhancer binding protein β (C/EBPβ) transcription factor, whereas macrophages suppressed HIV-1 replication and produced an inhibitory 16-kDa C/EBPβ transcription factor. IFN-β induced inhibitory 16-kDa C/EBPβ in macrophages, but had no effect on C/EBPβ expression in monocytes. Macrophages, but not monocytes, were able to activate IFN-stimulated gene factor-3 (ISGF-3), a transcription factor composed of STAT-1, STAT-2, and IFN regulatory factor (IRF)-9, after infection with M. tuberculosis or stimulation with type I IFN. Macrophages expressed IRF-9 DNA-binding activity, but monocytes did not, and addition of the IRF-9 component reconstituted ISGF-3 in extracts of IFN-treated monocytes. Modulation of IFN responsiveness upon differentiation occurred at least in part through a post-transcriptionally regulated increase in IRF-9 expression. Both monocytes and macrophages maintained IFN responsiveness, activating STAT-1 homodimer formation and transcription of the STAT-1 gene after IFN stimulation. In addition, both monocytes and macrophages were able to activate NF-κB upon infection with M. tuberculosis. These results show that induction of ISGF-3, expression of the inhibitory 16-kDa C/EBPβ, and suppression of HIV-1 replication via a transcriptional mechanism are macrophage-specific responses to infection with M. tuberculosis. Persistence of HIV-1 proviral DNA and viral RNA in PBMC after prolonged suppression of viral replication by highly active antiretroviral chemotherapy emphasizes the importance of understanding viral latency and the mechanism of viral reactivation in provirally infected cells (1, 2). The lung is a particularly important target organ for HIV-1 reactivation. There is a clear distinction between resting HIV-infected alveolar macrophages and those activated by a cellular immune response to Mycobacterium tuberculosis. In the absence of inflammation, viral replication is suppressed. Fewer than 3 in 105 alveolar macrophages are infected, even in advanced AIDS (3). Opportunistic infections such as pulmonary tuberculosis markedly up-regulate HIV-1 replication in the lung and lead to mutations in the viral envelope gp120 V3 region associated with increased virulence (4). As the alveolar macrophage is a major source of HIV-1 during pulmonary tuberculosis (5), understanding the regulation of viral replication in macrophages with and without inflammation is of both theoretical and clinical importance. We and others have used monocytic THP-1 cells as an in vitro model to better understand the mechanisms regulating HIV-1 LTR function. Proinflammatory stimuli such as TNF-α, LPS, or the mycobacterial cell wall product lipoarabinomannan stimulate HIV-1 long terminal repeat (LTR)3 promoter activity and HIV-1 replication in monocytic cells (6, 7, 8, 9, 10). This is in part due to NF-κB activation and in part due to stimulation by the C/EBP family of transcription factors, which binds to the LTR near the NF-κB sites. The enhancement of HIV-1 replication also occurs in primary blood monocytes after infection with M. tuberculosis or stimulation with mycobacterial products (11, 12). Surprisingly, when monocytes are differentiated to macrophages, TNF-α, LPS, and infection with M. tuberculosis suppress viral replication and LTR function (13, 14, 15). The effect of differentiation may be due to the interaction of proinflammatory stimuli and the IFN system. The suppression of HIV-1 replication seen after LPS stimulation closely resembles the suppression seen after addition of IFNs (13). Type I IFN is required for the suppressive effects of LPS and TNF-α on macrophages (16, 17), and IFN-β mRNA is induced after LPS stimulation (14). We have recently observed that in macrophages, M. tuberculosis infection induces an IFN response, and that IFN induces the expression of an inhibitory C/EBPβ transcription factor (15). IFNs, originally identified as cytokines that mediate antiviral immunity, also play a role in protection against bacterial infections (29). Type I IFNs (IFN-α and IFN-β) constitute an essential arm of the innate immune response that is activated by invariant characteristics of the pathogen (30, 31). Innate immunity is activated by and provides protection from pathogens in the time window before Ag-specific immunity can occur (32). The molecular mechanisms by which cells respond to IFNs have begun to be understood (33). Signal transduction in the type I IFN system is mediated by a high affinity transmembrane receptor composed of two subunits (34). Knockout mice deficient in the p100 subunit are exquisitely susceptible to viral infection (35). Upon binding of a type I IFN to its receptor, JAK-1 and TYK-2 protein tyrosine kinases are activated, resulting in activation of STAT proteins by tyrosine phosphorylation. Formation of IFN-stimulated gene factor-3 (ISGF-3) and STAT-1 homodimers can then occur without the need for protein synthesis. ISGF-3 is a heterotrimer of STAT-1, STAT-2, and IFN regulatory factor (IRF)-9 (previously called p48 or ISGF-3γ) that rapidly translocates to the nucleus and binds promoter sequences, named IFN-stimulated response elements (ISRE) to activate gene expression. STAT-1 homodimers bind to a IFN-γ-activated site (GAS) and activate an overlapping, but distinct, set of genes (36, 37). STAT-1 homodimers can also interact with IRF-9 and bind ISRE-type enhancer elements (36). It has become clear that additional regulation, often cell type specific, is superimposed on this framework (33, 37). For example, differentiation of monocytic cell lines in response to phorbol ester or all-trans-retinoic acid leads to increased levels of latent STAT-1, STAT-2, and IRF-9 (38, 39). Serine kinases, protein tyrosine phosphatases, tyrosine kinase inhibitor proteins, and activated STAT inhibitor proteins also participate in regulating ISGF-3 and STAT-1 homodimer activity (37, 40, 41, 42, 43, 44, 45, 46, 47). Since type I IFNs are present in tissue macrophages without any identified infection (48), resting tissue macrophages may be primed by low dose IFN to inhibit viral replication in the absence of inflammation. Therefore, we investigated further the interaction of IFNs and the production of inhibitory C/EBPβ. Here we report that production of inhibitory C/EBPβ is an IFN response in macrophages, but not monocytes. Alveolar macrophages express low levels of ISGF-3 and are able to activate ISGF-3 to a significant extent after stimulation with IFN or infection with M. tuberculosis. Monocytes fail to activate ISGF-3 and fail to inhibit HIV-1 replication after IFN stimulation or M. tuberculosis infection. Modulation of the IFN signal transduction pathway by differentiation is therefore closely linked to the production of a C/EBPβ transcriptional repressor that is likely to promote viral latency in resting alveolar macrophages. THP-1 cells were cultured in RPMI 1640 with 10% FBS. Cells were differentiated with 20 ng of PMA/ml for 24 h or as indicated in each experiment. For experiments to examine the effect of IFN on C/EBPβ, THP-1 cells were either left untreated or were pretreated with PMA for 24 h and then treated with IFN-β as indicated. For experiments examining IFN signaling, THP-1 cells were either left untreated or were pretreated with PMA for 24 h and then treated with 500 U of IFN-α/ml or 10 U of IFN-β/ml for 30 min unless otherwise indicated. The human embryonic kidney cell line 293T was cultured in DMEM with 10% FBS. HeLa S3 cells were cultured in DMEM with 10% CBS. Cytopathic effect assays were conducted essentially as previously described (49). HeLa S3 cells were seeded in 96-well plates and allowed to attach overnight. Conditioned media obtained from PMA-treated THP-1 cells 3 days after infection with M. tuberculosis (see below) and from parallel uninfected cultures were sterilely filtered. These media were not or were supplemented with 1/500 dilutions each of anti-IFNα and anti-IFNβ antisera (gifts from Jan Vilcek, New York University School of Medicine, New York, NY), and then used to replace the media for the HeLa cells. Each of these media or fresh media plus IFN-α and IFN-β, without or with antisera, was used in two wells. The monolayers were grown in these media 1 or 2 days more, until nearly confluent, then infected with various dilutions of vesicular stomatitis virus (VSV). Approximately 24 h later, cells were stained with crystal violet (λmax = 588 nm) and washed with water. After the wells were dry, dye was solubilized in 50% ethanol, and absorbance at 590 nm was measured with an ELISA plate reader. OD values were corrected for stained empty wells. The duplicate wells were averaged, and the averages were normalized to the average corrected absorbance of uninfected monolayers. Results are shown for virus multiplicity of infection (MOI) that produced 30–60% cytopathic effect in the absence of anti-IFN antisera. Alveolar macrophages were obtained by bronchoalveolar lavage, which was performed with a flexible fiberoptic bronchoscope with local xylocaine anesthesia. We instilled six 50-ml aliquots (total, 300 ml) of normal saline and suctioned at 20–30 mm Hg. The lavage fluid was filtered through sterile gauze to remove mucus, and total cells were counted in a hemocytometer. Cell differentials were performed on cytospin slides stained with Wright-Giemsa. For purification of alveolar macrophages, bronchoalveolar lavage cells were pelleted, suspended in RPMI 1640, allowed to adhere to plastic plates, then washed. PBMC were obtained from blood by Ficoll-Hypaque sedimentation, and buffy coats were washed four times in PBS. PBMC were suspended in RPMI 1640 with 10% FCS and allowed to adhere to plastic plates for 3 h and washed with PBS. Alveolar macrophages and monocytes were removed from plastic by gentle scraping with a rubber policeman. Alveolar macrophages and monocytes were 95% pure by morphology and nonspecific esterase staining. Bronchoalveolar lavage was approved by the New York University Medical Center institutional review board. Purified blood monocytes were incubated for 7 days with 1000 U/ml of M-CSF. 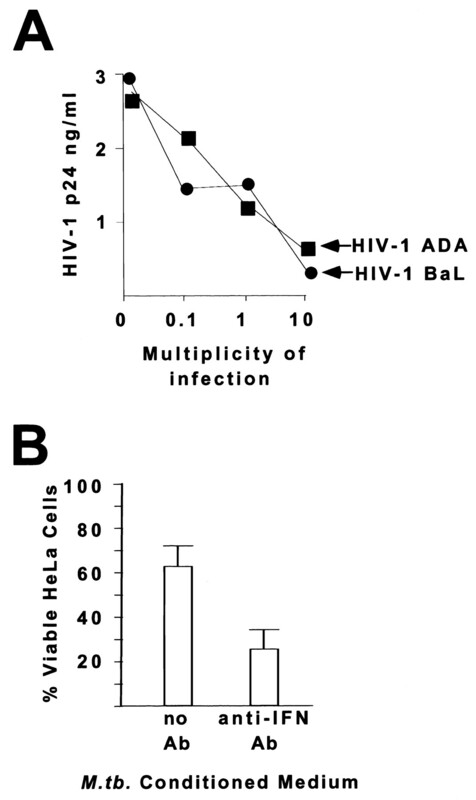 Then cells were infected with BaL or ADA strains of HIV (1 ng of p24/ml). After overnight incubation, cells were coinfected with M. bovis bacillus Calmette-Guérin at various MOI for 2 h at 37°C. They were then washed twice and incubated with RPMI 1640/10% FCS containing M-CSF. p24 was assayed by ELISA 7 days after infection. Experiments with M. tuberculosis were performed with strain TN913, a prevalent clinical isolate obtained from the PHRI TB Center, except, for comparison to previous studies (15), strain H37Ra was used for the experiment to examine the effect of infection on C/EBPβ isoforms. All M. tuberculosis infections were conducted at an MOI of 1 for 24 h unless otherwise stated. Control uninfected cells were cultured for 24 h in parallel before extract preparation. IFN-treated samples were stimulated for the last 30 min of the experiment. The extent of infection was determined by acid fast staining of cells washed twice in PBS, before extract preparation. Acid fast bacilli were detected by light microscopy in 20–30% of monocytes and 40–50% of macrophages. Viable cell count and CFU recovery were determined for aliquots of washed cells. The average for individual experiments ranged from one to four bacilli per infected cell, after correction for the percentage of cells infected, consistent with microscopic examination of the stained cells. HIV and M. tuberculosis infections were performed in a BSL-3 laboratory. Cells were washed twice in PBS. Whole-cell extracts were prepared for immunoblot analysis by incubation in RIPA buffer (PBS, 1% Nonidet P-40, and 0.5% deoxycholate) containing 3 μg/ml aprotinin, 1 mM PMSF, and 1 mM sodium orthovanadate for 30 min and disruption by passage through a 21-gauge needle. Whole-cell extracts for EMSA were prepared by Nonidet P-40 lysis and salt extraction with 3 μl of extraction buffer/105 cells, as previously described (49). Nuclear extracts were prepared by Nonidet P-40 lysis and incubation of recovered nuclei in high salt buffer, as previously described (50). Transfection of an IRF-9 expression construct into 293T cells was performed as previously described (36) to obtain recombinant IRF-9 in Nonidet P-40 whole cell extracts prepared 2 days post-transfection. Production of recombinant IRF-9 was assessed by immunoblot and EMSA. Immunodepleted 293T/IRF-9 extracts were prepared by incubation with antiserum (nonspecific or anti-IRF-9) and protein A-agarose beads (Schleicher & Schuell, Keene NH), followed by removal of the beads. Extracts of cells infected with M. tuberculosis were prepared in a BSL-3 laboratory and sterilized by filtration before removal. Pierce bicinchoninic acid or Bio-Rad Bradford reagents (Hercules, CA) were used to determine extract protein concentrations. Proteins were separated by SDS-PAGE. For each gel, equal amounts of protein were loaded in each lane. From gel to gel, the amount of protein per lane was 30–100 μg for detection of endogenous proteins, but ∼1 μg for detection of recombinant IRF-9. For detection of C/EBPβ or NF-κB, 10–20% linear-gradient gels were used. For detection of IRF-9, 10% gels were used. After electrophoresis, protein was electrotransferred to nylon membranes for detection of C/EBPβ or NF-κB or to nitrocellulose membranes for detection of IRF-9. Membranes were blocked with nonfat dry milk, then probed with Abs against C/EBPβ (catalog no. sc-150, lot D168 or E236), NF-κB p65 (catalog no. sc-109, lot D119), both from Santa Cruz Biotechnology (Santa Cruz, CA) or IRF-9 (36), as indicated for each experiment, then visualized with anti-rabbit HRP and ECL (Amersham, Arlington Heights, IL). Multiple film exposures were scanned by laser densitometry and analyzed with ImageQuant software (Molecular Dynamics, Sunnyvale, CA) for quantitation of immunoreactive C/EBPβ or IRF-9 bands. Both the anti-C/EBPβ and anti-IRF-9 antisera reacted with nonspecific bands, which confirmed equal protein loading from lane to lane. The ISRE probe was 5′-CTCGGGAAAGGGAAACCGAAACTGAAGCC. The GAS probe was TACAACAGCCTGATTTCCCCGAAATGACGGC. The NF-κB probe was TGGGCTGGGGAATCCCGCTAA. The respective ISRE, GAS, and NF-κB consensus sequences are shown in boldface. Probes were end labeled, and binding reactions without or with Abs were performed as previously described (51). Within an experiment, each binding reaction included a constant amount of extract protein. The amount varied from 10 to 20 μg among experiments, except that only 1 μg of 293T/IRF-9 extract was used per binding reaction. Protein/DNA complexes were electrophoresed on 6% polyacrylamide gels at 4°C with 20 mM Tris-borate (pH 8.3)/0.4 mM EDTA buffer. Images were produced by autoradiography or PhosphorImager (Molecular Dynamics). ImageQuant software (Molecular Dynamics) was used for analysis of quantitative data obtained with the PhosphorImager. Cells were treated as described in Fig. 6⇓. Run-on assays were performed as previously described (51, 52). Radiolabeled nascent RNA was isolated and hybridized to excess plasmid DNA fixed to nitrocellulose. A β-actin clone was used as an internal standard. Bluescript KS− (Stratagene, La Jolla, CA) and RcCMV (Invitrogen, San Diego, CA) were used as negative controls and to determine background signal. The IRF-9 cDNA clone has been previously described (36). The STAT-1 and STAT-2 cDNA clones were previously called p91 and p113, respectively (51). The results were visualized and quantitated with a PhosphorImager and ImageQuant software (Molecular Dynamics). Similar to monocytic THP-1 cells, primary adherent blood monocytes increase HIV-1 replication after infection with M. tuberculosis (7, 11). We previously observed that M. tuberculosis suppresses HIV-1 replication in THP-1 cells differentiated to a macrophage-like state by treatment with PMA (15). To test whether primary macrophages are also able to suppress HIV-1 replication after mycobacterial infection, HIV-1 replication was assayed in macrophages derived from peripheral blood monocytes by differentiation with M-CSF. Monocyte-derived macrophages were similar to THP-1 cells treated with PMA; both supported high levels of HIV-1 replication, producing 1–3 ng/ml of p24 Ag 7 days after infection (Fig. 1⇓A). M. bovis bacillus Calmette-Guérin produced a dose-dependent suppression of p24 production in monocyte-derived macrophages, using two macrophage-tropic strains of HIV-1, ADA and BaL. At an MOI of 1, HIV-1 p24 production was diminished by >50% in both viral strains without a significant reduction in cell viability. At an MOI of 10, viral production decreased by 80–90% in both HIV-1 strains. Therefore, macrophages derived from primary blood monocytes by M-CSF differentiation are similar to THP-1 cells treated with PMA to become macrophage-like. M. tuberculosis induces an IFN response in macrophages. A, Dose-dependent suppression of HIV-1 replication in monocyte-derived macrophages differentiated with M-CSF following mycobacterial infection. Macrophages were infected with two strains of HIV-1 and then coinfected with M. bovis bacillus Calmette-Guérin at increasing MOIs. HIV-1 p24 Ag was measured 7 days later to assay for HIV-1 replication. B, IFN in conditioned medium of THP-1 cells treated with PMA and infected with M. tuberculosis inhibits the VSV cytopathic effect. HeLa cells grown in conditioned medium have 63% viability 24 h after infection with VSV. In the presence of Abs against type I IFNs, 26% of the HeLa cells survive. Results are shown ± SEM. When HeLa cells were grown in conditioned medium from PMA-treated THP-1 cells that had not been infected with M. tuberculosis, a similar cytopathic effect of VSV infection was not altered by these Abs (data not shown). An autocrine response to type I IFN produced upon mycobacterial infection of macrophages might account for inhibition of HIV-1 replication. To test for the presence of type I IFN, the effect of neutralizing anti-type I IFN antisera on the VSV cytopathic effect was determined in HeLa cells incubated with conditioned media from PMA-treated THP-1 cells infected with M. tuberculosis. In the presence of conditioned media alone, 63 ± 9% of the HeLa cells were alive 24 h after virus infection. Only 26 ± 8% of the HeLa cells were alive if the neutralizing antisera were added to the conditioned media (Fig. 1⇑B; mean ± SEM of three independent experiments). In these experiments, addition of the neutralizing antisera did not alter the VSV cytopathic effect when HeLa cells were incubated in conditioned media from uninfected PMA-treated THP-1 cells, but the antisera did neutralize exogenously added IFN-α and IFN-β (data not shown). This result demonstrates that M. tuberculosis infection causes secretion of type I IFN. Because C/EBP binding sites are required for HIV-1 LTR-mediated transcription in macrophages (6, 20, 21), and the C/EBPβ gene can produce a 16-kDa dominant-negative transcription factor (24), we investigated whether changes in C/EBPβ expression could account for the effect of monocyte differentiation on the interaction of M. tuberculosis infection and HIV-1 replication. Without infection or PMA treatment, THP-1 cells had barely detectable levels of the 37- and 16-kDa C/EBPβ (Fig. 2⇓A, lanes 1 and 6). A cross-reacting 40-kDa protein was detected in the immunoblots, but was nonspecific (Fig. 2⇓, labeled ns), since it was expressed in unstimulated THP-1 cells that had negligible C/EBP DNA-binding activity (15). C/EBPβ expression in undifferentiated and differentiated mononuclear phagocytes after infection with M. tuberculosis or stimulation with IFN-β. A, Left panel, M. tuberculosis induced stimulatory 37-kDa C/EBPβ in undifferentiated THP-1 monocytes between 24 and 72 h (lanes 2–4). M. tuberculosis induced inhibitory 16-kDa C/EBPβ in THP-1 macrophages 48 h postinfection (lane 5). Right panel, PMA-induced differentiation did not alter C/EBPβ expression (lanes 6–9, 5-day time course). The right panel is overexposed relative to the left panel, so that the 16-kDa C/EBPβ is visible in both. At similar levels of exposure, lanes 1 and 6–9 show similar levels of 37- and 16-kDa C/EBPβ. B, Freshly adherent blood monocytes expressed negligible levels of 16-kDa C/EBPβ (lane 1). After differentiation with M-CSF there was some induction of 16-kDa C/EBPβ (lane 2). Monocyte-derived macrophages infected with M. tuberculosis strongly induced the 16-kDa C/EBPβ (lane 3). C, C/EBPβ expression in THP-1 monocytes was not altered by IFN-β (lanes 1–3, 48-h time course). Inhibitory 16-kDa C/EBPβ was increased 48 h after IFN treatment of differentiated THP-1 cells (lane 4). A nonspecific (ns) cross-reacting band without DNA-binding activity is marked. Monocytic THP-1 cells strongly induced stimulatory 37-kDa C/EBPβ after infection with M. tuberculosis; under these conditions, inhibitory 16-kDa C/EBPβ comprised <5% of the total (Fig. 2⇑A, lanes 2–4). M. tuberculosis infection of PMA-treated THP-1 cells produced both inhibitory 16-kDa C/EBPβ and stimulatory 37-kDa C/EBPβ 48 h after infection, with the inhibitory isoform representing ∼30% of the total C/EBPβ (Fig. 2⇑A, lane 5). Since the induction of 37-kDa C/EBPβ by infection was similar in both untreated and PMA-treated THP-1 cells, it is unlikely that greater M. tuberculosis uptake after PMA treatment accounts for the difference in 16-kDa C/EBPβ expression. Furthermore, treatment of THP-1 cells with PMA by itself did not alter C/EBPβ expression (Fig. 2⇑A, lanes 7–9). Therefore, PMA-treated THP-1 cells gained the ability to produce inhibitory 16-kDa C/EBPβ in response to M. tuberculosis infection. To test whether primary blood-derived monocytes and macrophages are similar to untreated and PMA-treated THP-1 cells, immunoblots were performed on blood monocytes and monocytes differentiated to macrophages by stimulation with M-CSF. Similar to untreated THP-1 cells, blood monocytes expressed barely detectable levels of the inhibitory 16-kDa C/EBPβ (Fig. 2⇑B, lane 1). After differentiation with M-CSF there was some induction of inhibitory C/EBPβ (Fig. 2⇑B, lane 2), which was augmented 2-fold after infection with M. tuberculosis (Fig. 2⇑B, lane 3), while the level of stimulatory C/EBPβ was essentially constant. Thus, only PMA-treated THP-1 cells and primary macrophages were able to produce inhibitory C/EBPβ. In the absence of a proinflammatory stimulus, primary macrophages had higher levels of inhibitory C/EBPβ than PMA-treated THP-1 cells. However, M. tuberculosis infection increased the amount of inhibitory C/EBPβ, and the ratio of inhibitory to stimulatory C/EBPβ in primary macrophages. Since M. tuberculosis infection of macrophages produces a type I IFN response, and the type I IFNs induce inhibitory C/EBPβ only in macrophages, differentiation may alter C/EBPβ expression in response to type I IFNs. To test this idea, we examined the C/EBPβ response of untreated THP-1 cells to IFN-β stimulation. IFN-β had no effect on the abundance of C/EBPβ isoforms in untreated THP-1 cells (Fig. 2⇑C, lanes 1–3), but strongly induced inhibitory 16-kDa C/EBPβ after PMA treatment (Fig. 2⇑C, lane 4). PMA-treated THP-1 cells are able to suppress HIV-1 replication and LTR function at 1 U/ml IFN-β (13, 15), but THP-1 cells treated with only 1 or 10 U/ml IFN-β did not suppress HIV-1 replication (data not shown). This suggests that induction of inhibitory C/EBPβ is a type I IFN response in macrophages, but not monocytes, as modeled by PMA-treated and untreated THP-1 cells, and that the state of differentiation affects the ability of type I IFN to inhibit HIV-1 replication. The observation that type I IFN induces inhibitory C/EBPβ in THP-1 cells only after PMA treatment suggests that differentiation alters the IFN response. Differentiation could modulate the abundance or function of IFN receptor, intracellular signaling intermediates, or the transcription factors that mediate IFN response. In general, at least two transcription-factor complexes form without the need for protein synthesis due to activation of latent STAT-1 and STAT-2. They are ISGF-3, a STAT-1, STAT-2, and IRF-9 heterotrimer that binds to ISRE sequences, and STAT-1 homodimer, which binds to GAS sequences (33). Activation of latent transcription factors after IFN stimulation would demonstrate intact upstream signal transduction. We have previously observed that PMA-treated THP-1 cells activate ISGF-3 after infection with M. tuberculosis (15). To test whether differentiation was necessary for this response to infection, THP-1 cells with and without PMA treatment were infected with M. tuberculosis in a time-course experiment. Four hours after M. tuberculosis infection, ISGF-3 was activated in PMA-treated (Fig. 3⇓A, lane 4), but not untreated (Fig. 3⇓A, lane 2), THP-1 cells. The amount of ISGF-3 activated by M. tuberculosis infection was greater at 14 and 24 h after infection (Fig. 3⇓A, lanes 8 and 12). Therefore, M. tuberculosis infection was able to elicit an obvious IFN response only after PMA treatment. Since monocytes produce type I IFN in response to proinflammatory stimuli (14), the inability of infected monocytes to form ISGF-3 probably reflects a partial defect in their response to IFN. ISRE DNA-binding activity in monocytes and macrophages. A, Undifferentiated THP-1 cells did not activate ISGF-3 after infection with M. tuberculosis (lanes 2, 6, and 10). Differentiated THP-1 cells activated ISGF-3 between 4 and 24 h after infection with M. tuberculosis (arrow, lanes 4, 8, and 12). Differentiation induced new ISRE binding activities that remain to be fully characterized (lanes 3, 4, 7, 8, 11, and 12). Nonspecific complexes with each probe, indicated by ns, served as internal standards for protein loading. B, Undifferentiated THP-1 monocytes did not activate ISGF-3 after IFN-α stimulation (lane 2) or infection with M. tuberculosis (lane 3); however, differentiated THP-1 macrophages activated ISGF-3 after either IFN-α stimulation (lane 5) or infection with M. tuberculosis (lane 6). Primary monocytes did not activate ISGF-3 after infection with M. tuberculosis (lane 7), but unstimulated alveolar macrophages expressed a low level of ISGF-3 (lane 9) that was augmented 23-fold by IFN-α (lane 10) and 4-fold by infection with M. tuberculosis (lane 11). No Tx, control cells that were not stimulated or infected. C, Alveolar macrophages infected with M. tuberculosis produce ISGF-3 (lane 1, position marked with arrow), which is competed with excess unlabeled ISRE oligonucleotide (lane 2). IFN-α stimulation strongly induced ISGF-3 in alveolar macrophages (lanes 3–9). The induced complex is a doublet that comigrates with the complex induced by M. tuberculosis (lane 3). This complex is competed with ISRE oligonucleotide (lane 4). The ISGF-3 complexes are not disrupted by nonspecific Ab (lane 5) or Ab against IRF-1 (lane 7). The ISGF-3 complex is disrupted by Ab against IRF-9 (lane 6), STAT-1 (lane 8), or STAT-2 (lane 9). The anti-STAT-1 Ab reveals another doublet that has slightly more rapid migration than and 20% the intensity of ISGF-3. To directly test the effect of PMA on IFN responsiveness, THP-1 cells with and without PMA treatment were stimulated with type I IFN. Monocytic THP-1 cells did not activate ISGF-3 in response to IFN-α (Fig. 3⇑B, lane 2). In contrast, IFN-α stimulation strongly activated ISGF-3 in PMA-treated THP-1 cells (Fig. 3⇑B, lane 5). Infection of PMA-treated THP-1 cells with M. tuberculosis induced less ISGF-3 than did IFN-α treatment (Fig. 3⇑B, lane 6). To test whether THP-1 cells are an accurate model for primary cells, EMSA was repeated with extracts from blood monocytes and alveolar macrophages. Blood monocytes did not induce ISGF-3 after infection with M. tuberculosis (Fig. 3⇑B, lane 8). However, in alveolar macrophages, IFN-α stimulation induced a 23-fold increase in ISGF-3 (Fig. 3⇑B, lane 10), and M. tuberculosis infection induced a 4-fold increase in ISGF-3 (Fig. 3⇑B, lane 11). Thus, the change in IFN signaling after differentiation of THP-1 cells is similar to the difference between primary blood monocytes and alveolar macrophages. Unlike differentiated THP-1 cells, resting alveolar macrophages expressed a low level of ISGF-3 (Fig. 3⇑B, lane 9). This may be due to the low level of IFN observed in tissue macrophages (48). The identity of ISGF-3 in extracts of alveolar macrophages was confirmed using competition with excess unlabeled ISRE oligonucleotide and supershifts with Abs against STAT-1, STAT-2, and IRF-9. Competition demonstrated that the ISGF-3 complexes formed after infection (Fig. 3⇑C, compare lanes 1 and 2) or treatment with type I IFN (Fig. 3⇑C, compare lanes 3 and 4) were specific for the ISRE sequence. The ISGF-3 complexes induced by IFN were disrupted by Abs against IRF-9, STAT-1, and STAT-2 (Fig. 3⇑C, lanes 6, 8, and 9). ISRE/protein complexes that contain IRF-9 and STAT-2 and migrate slightly more rapidly than similar complexes that contain STAT-1, STAT-2, and IRF-9 became apparent after supershift with STAT-1 Ab (Fig. 3⇑C, lane 8). A nonspecific Ab and an Ab against IRF-1 did not affect any of these ISRE/protein complexes (Fig. 3⇑C, lanes 5 and 7). 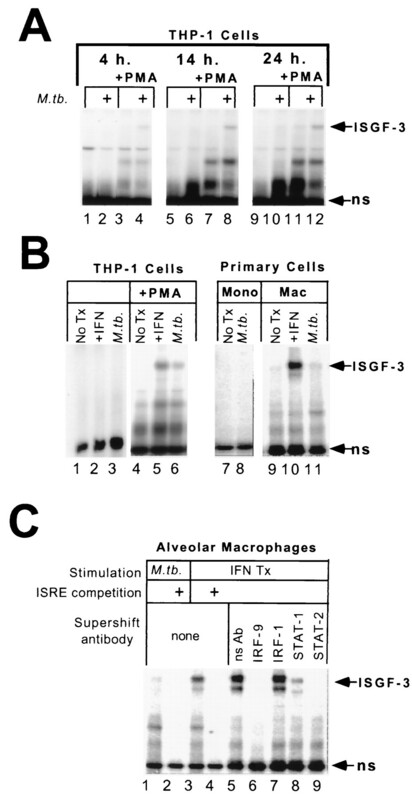 Additional ISRE/protein complexes that contain IRF-9 are apparent in the alveolar macrophage extracts (Fig. 3⇑C, compare lanes 5 and 6). These data demonstrate that differentiation alters IFN responsiveness. Macrophages gain the ability to form ISGF-3 after treatment with type I IFN or infection with M. tuberculosis. At least in PMA-treated THP-1 cells, this effect of infection presumably includes an autocrine response to the type I IFN secreted upon infection. Formation of STAT-1 homodimer was examined by EMSA with a GAS probe to assess whether the lack of ISGF-3 formation was due to failure to transduce a type I IFN signal. 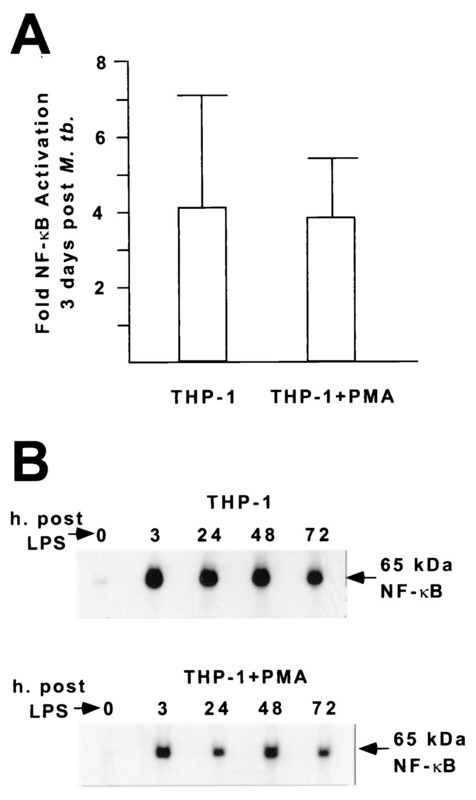 Both THP-1 cells and PMA-treated THP-1 cells produced STAT-1 homodimers after stimulation with 500 U/ml IFN-α (Fig. 4⇓, lanes 2 and 7) or 100 U/ml IFN-β (data not shown). The identity of STAT-1 was confirmed by its reaction with specific, but not nonspecific, antisera (Fig. 4⇓, compare lane 5 with lane 4 and lane 10 with lane 9). 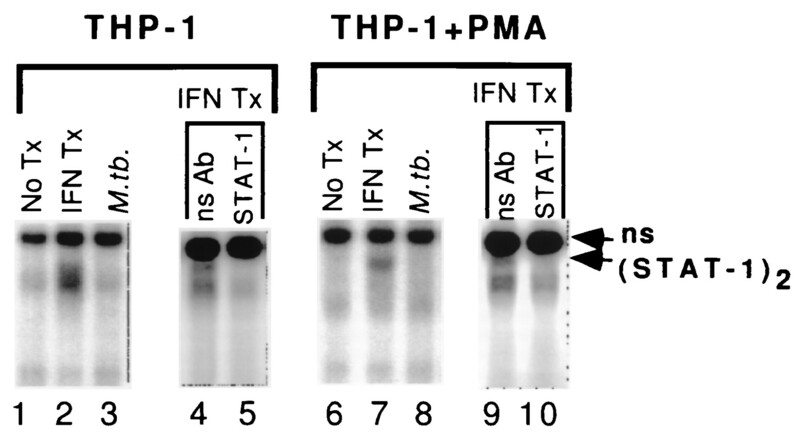 M. tuberculosis infection did not activate STAT-1 homodimer formation in untreated or PMA-treated THP-1 cells (Fig. 4⇓, lanes 3 and 8). The results of the EMSA demonstrate that in this model of monocytes and macrophages, both cell types have intact signal transduction pathways up to the point of STAT-1 phosphorylation. STAT-1 DNA-binding activity in THP-1 monocytes and macrophages was detected by EMSA with a GAS probe. Undifferentiated (lanes 1–5) and differentiated (lanes 6–10) THP-1 cells activated STAT-1 homodimers after IFN-α stimulation (lanes 2 and 7). M. tuberculosis did not activate STAT-1 homodimers in either undifferentiated or differentiated THP-1 cells (lanes 3 and 8). Nonspecific Ab did not disrupt the induced complexes (lanes 4 and 9), while STAT-1 Ab did disrupt the complexes (lanes 5 and 10). Failure to form ISGF-3 after type I IFN stimulation or infection with M. tuberculosis might be due to limiting levels of IRF-9. To test this possibility, EMSA was used to detect IRF-9 activity with an ISRE probe. 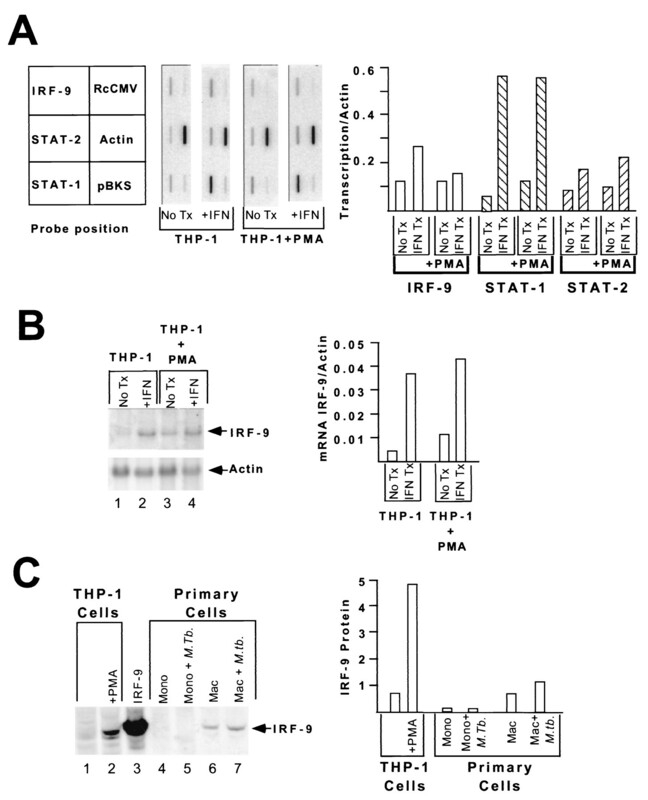 Undifferentiated THP-1 cell extracts did not produce an IRF-9/ISRE complex (Fig. 5⇓A, lane 1). When recombinant IRF-9 derived from transiently transfected 293T cells was added to these THP-1 extracts, an IRF-9/ISRE complex was detected (Fig. 5⇓A, lane 2). PMA treatment induced high level IRF-9 activity in THP-1 cells (Fig. 5⇓A, lane 3). Similar to untreated THP-1 cells, an extract of blood monocytes did not produce an IRF-9/ISRE complex, but exogenous IRF-9 added to that extract did bind the ISRE (Fig. 5⇓A, lanes 4 and 5). Similar to PMA-treated THP-1 cells, alveolar macrophages had high levels of IRF-9 activity, as judged by comigration with an IRF-9/ISRE complex (Fig. 5⇓A, lane 6) and reaction with anti-IRF-9 Ab in an EMSA (data not shown). The similarities between transformed and primary cells further supports using THP-1 cells and PMA-treated THP-1 cells as a model for primary monocytes and macrophages. Therefore, differentiation of THP-1 cells and primary cells up-regulated IRF-9 activity. IRF-9 expression and function in monocytes and macrophages. A, IRF-9 activity in monocytes and macrophages detected by EMSA. Extracts of undifferentiated THP-1 cells did not produce an IRF-9/ISRE complex (lane 1, arrow), but the addition of 293T extract containing IRF-9 to undifferentiated THP-1 cell extracts did produce one (lane 2). Extracts of differentiated THP-1 cells did produce an IRF-9/ISRE complex (lane 3). Extracts of blood monocytes did not produce an IRF-9/ISRE complex (lane 4), but the addition of 293T extracts containing IRF-9 to the monocyte extracts did produce one (lane 5). Extracts of alveolar macrophages did produce an IRF-9/ISRE complex (lane 6). B, Complementation of THP-1 monocyte extracts with IRF-9 expressed in 293T cells. Extracts of untransfected 293T cells did not add any ISRE-binding activity to untreated THP-1 monocytes (lane 1). Extracts of 293T cells transfected to express IRF-9 added an ISRE-binding activity to extracts of untreated monocytes (lane 2). Monocyte extracts produced no ISGF-3 complexes after IFN-α treatment (lane 3). Extracts of 293T cells transfected with IRF-9 produced ISGF-3 when added to extracts of IFN-α-treated monocytes (lane 4). Immunodepletion of transfected 293T extracts with nonspecific Ab did not abolish ISGF-3 reconstitution (lane 5). Immunodepletion of transfected 293T extracts with anti-IRF-9 Ab did abolish ISGF-3 reconstitution (lane 6). The ISGF-3 complex is not disrupted by nonspecific Ab (lane 7). The ISGF-3 complex is disrupted by Abs against IRF-9 (lane 8), STAT-1 (lane 9), or STAT-2 (lane 10). With anti-STAT-1 Ab, some residual ISRE-binding activity is apparent. To test whether low IRF-9 activity was functionally important, recombinant IRF-9 was added back to extracts of IFN-α-stimulated monocytes. 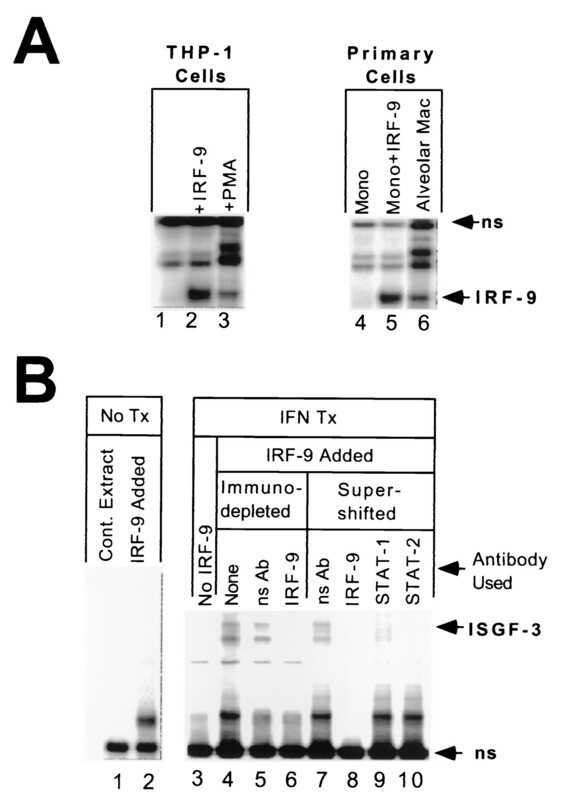 Recombinant IRF-9 did reconstitute ISGF-3 in extracts of IFN-treated THP-1 cells (Fig. 5⇑B, compare lanes 3 and 4). This demonstrated that THP-1 cells were able to activate STAT-1 and STAT-2 after IFN stimulation. Complementation of monocyte extracts was not due to nonspecific effects. ISGF-3 was not reconstituted when control extracts from untransfected 293T cells were mixed with extracts of untreated or IFN-treated monocytes (Fig. 5⇑B, lane 1, and data not shown), and recombinant IRF-9 did not reconstitute ISGF-3 when mixed with extract from untreated THP-1 cells (Fig. 5⇑B, lane 2). We confirmed that IRF-9 was responsible for reconstitution of ISGF-3 by immunodepletion experiments. ISGF-3 was reconstituted after mock immunodepletion of IRF-9 from 293T extracts by nonspecific antiserum (Fig. 5⇑B, lane 5); immunodepletion with anti-IRF-9 antiserum abrogated ISGF-3 formation (Fig. 5⇑B, lane 6). To corroborate the identity of ISGF-3 we performed supershift reactions. The reconstituted ISRE/protein complexes were not affected by control Ab (Fig. 5⇑B, lane 7), but both complexes reacted with Abs against each subunit of ISGF-3 (Fig. 5⇑B, lanes 8–10). Similar to supershift experiments with IFN-treated alveolar macrophages, some residual ISRE/protein complex remained after addition of anti-STAT-1 Ab (Fig. 5⇑B, lane 9). These data indicate that IFN treatment of undifferentiated THP-1 cells activates latent STAT-1 and STAT-2, but that ISGF-3 is not produced because of inadequate IRF-9. Since increased IRF-9 activity is essential for ISGF-3 induction, we sought to better understand the regulation of IRF-9 expression during differentiation. A nuclear run-on assay was used to measure transcription of the IRF-9 gene after treatment with type I IFN in THP-1 cells with and without PMA differentiation. For comparison, the transcription of the STAT-1 and STAT-2 genes was also measured. The amount of radioactivity incorporated into nascent RNA was normalized to the signal for actin transcription, so that different nuclear preparations could be directly compared. The actin signal did not vary >20% among experimental conditions, indicating that actin is an appropriate internal standard. Surprisingly, PMA treatment by itself did not significantly increase IRF-9 transcription (Fig. 6⇓A), while it did produce a small increase in STAT-1 transcription. After a 4-h IFN-β stimulation of the untreated or PMA-treated cells, there was little or no change in IRF-9 transcription, while STAT-1 transcription was strongly induced. These data provide further evidence of a functional response to type I IFN in THP-1 cells with and without PMA treatment and show that regulation of IRF-9 DNA-binding activity is post-transcriptional. Effect of differentiation and type I IFN stimulation on IRF-9 expression in THP-1 cells. A, Differentiation did not alter IRF-9 transcription, while IFN-β produced marked increases in STAT-1 transcription 4 h after stimulation in both undifferentiated and differentiated THP-1 cells. Nuclear run-on data are shown; plasmids containing the indicated inserts as probes are identified on the left. The actin probe provided an internal standard. Bluescript KS− (Stratagene) and RcCMV (Invitrogen) plasmids without insert were used as negative controls. Transcription of STAT-1, STAT-2, and IRF-9 genes is shown in THP-1 monocytes and macrophages without (No Tx) or 4 h after stimulation with 10 U of IFN-β/ml. The bar graph to the right shows the signal intensity of the filters shown on the left. B, Differentiation did increase IRF-9 mRNA levels. Upper left, Northern blot demonstrates that there is little IRF-9 expressed in undifferentiated monocytes (lane 1). Stimulation with IFN-α for 4 h increases IRF-9 mRNA by 7-fold in undifferentiated cells (lane 2). There is a 3-fold increase in IRF-9 mRNA following differentiation (lane 3). Stimulation of differentiated cells with IFN-α for 4 h increases IRF-9 mRNA an additional 5-fold (lane 4). Lower left, All IRF-9 levels are normalized to actin expression determined by reprobing the same filter. The bar graph to the right shows the signal intensity of the Northern blot data. C, IRF-9 immunoblot of monocytes and macrophages. There is very low expression of IRF-9 in THP-1 monocytes (lane 1), which increases upon differentiation (lane 2). Extracts of 293T cells transfected with an IRF-9 expression plasmid provides a positive control (lane 3). Blood monocytes do not express IRF-9 (lane 4) and infection with M. tuberculosis does not affect IRF-9 expression (lane 5). Alveolar macrophages express IRF-9 (lane 6) and infection with M. tuberculosis increases IRF-9 expression by 30% (lane 7). The bar graph to the right shows the signal intensity of the immunoblot shown on the left. We next determined whether changes in IRF-9 mRNA could account for the increased IRF-9 DNA-binding activity observed upon differentiation. By Northern blot analysis, IRF-9 mRNA was barely detectable in untreated THP-1 cells (Fig. 6⇑B, lane 1). PMA treatment markedly increased IRF-9 mRNA (Fig. 6⇑B, lane 2). Type I IFN treatment led to a further increase in IRF-9 expression (Fig. 6⇑B, lanes 2 and 4). Finally, we assayed IRF-9 protein abundance by immunoblot. Little or no IRF-9 protein was detected in THP-1 cells and primary monocytes (Fig. 6⇑C, lanes 1 and 4). IRF-9 protein was markedly up-regulated in PMA-treated THP-1 cells and primary macrophages (Fig. 6⇑C, lanes 2 and 6). Importantly, IRF-9 was not induced in monocytes by infection with M. tuberculosis (Fig. 6⇑C, compare lanes 4 and 5) and was only slightly induced in macrophages after M. tuberculosis infection (Fig. 6⇑C, compare lanes 6 and 7). Recombinant IRF-9 was used to confirm the authenticity of the bands observed in monocytes and macrophages (Fig. 6⇑C, lane 3). These data demonstrate that differentiation increased IRF-9 activity by increasing IRF-9 protein. Furthermore, the occurrence of a significant change in IRF-9 mRNA and protein, but not transcription, supports the conclusion that induction of IRF-9 upon differentiation is post-transcriptionally regulated. It is possible that the effect of differentiation on viral replication after a proinflammatory stimulus is mediated by more than one transcription factor. NF-κB is another transcription factor that is activated by M. tuberculosis infection or other proinflammatory stimuli such as LPS. The HIV-1 LTR is strongly stimulated by NF-κB, and inhibition of NF-κB activation could add to the effect of differentiation on LTR function and viral replication after a proinflammatory stimulus. To test whether the down-regulation of the HIV-1 LTR observed in differentiated THP-1 cells after proinflammatory stimulation is due in part to altered regulation of NF-κB, the effects of M. tuberculosis infection or LPS treatment were examined. EMSA with an NF-κB probe was performed with whole-cell or nuclear extracts of untreated and PMA-treated THP-1 cells prepared 3 days after infection with M. tuberculosis. M. tuberculosis infection increased NF-κB activation ∼4-fold in differentiated and undifferentiated THP-1 cells (Fig. 7⇓A), as judged by formation of a protein/DNA complex that was supershifted with Ab to NF-κB or competed with excess unlabeled NF-κB oligonucleotide (data not shown). In time-course experiments using LPS as the proinflammatory stimulus, p65 Rel A translocated to the nucleus within 3 h with and without PMA treatment (Fig. 7⇓B). There was some variation from sample to sample, but nuclear localization of NF-κB, indicating activation, remained high over the 72-h time course in both cell types. These data demonstrate that differentiation does not limit NF-κB activation after a proinflammatory stimulus and suggest that the inhibitory effect of the 16-kDa C/EBPβ factor is dominant over the stimulatory effect of NF-κB. Equal activation of NF-κB in THP-1 monocytes and macrophages after proinflammatory stimuli. A, Enhanced NF-κB/DNA complex formation in monocytes and macrophages 3 days after infection with M. tuberculosis. A nonspecific protein/DNA complex in each lane was used as an internal standard for normalization, and then the specific NF-κB activity was corrected for the minimal background that remained after supershift or competition. Error bars represent ±SD. B, Immunoblot analysis of NF-κB p65 subunit demonstrated LPS-induced translocation to the nucleus within 3 h in undifferentiated and differentiated THP-1 cells. High level NF-κB activation was maintained through 72 h.
Transcriptional regulation of the HIV-1 LTR is critical for viral production in provirally infected cells. Cells that completely repress LTR activity will not express virally encoded proteins and will be latently infected. Long-lived, latently infected cells serve as reservoirs for reactivation of virus after prolonged suppression of viral replication with highly active antiretroviral therapy (HAART). PBMC composed of lymphocytes and monocytes continue to harbor intact provirus up to 3 yr after effective suppression of viral replication with HAART (1, 2). Induction of latent HIV-1 in blood monocytes has been demonstrated (53). Memory T cells also serve as one population in which viral reactivation after prolonged HAART can occur (54). 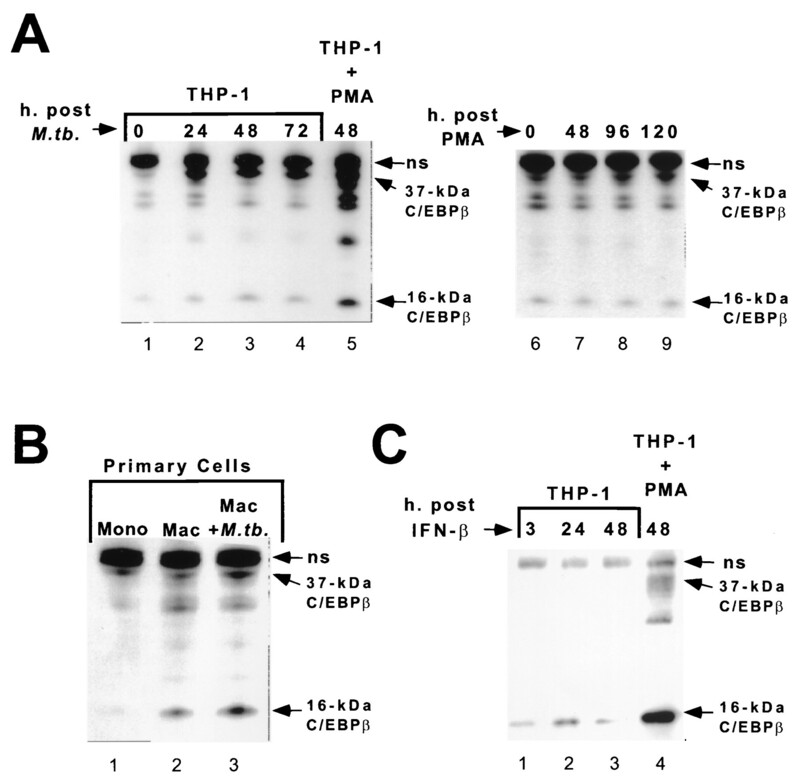 In this paper we examined primary monocytes and macrophages and, as a model, the THP-1 cell line before or after PMA treatment, for the effect of differentiation on HIV-1 replication. We observed that macrophages and PMA-treated THP-1 cells gained the ability to respond to proinflammatory stimuli by induction of the type I IFN-specific transcription factor ISGF-3. Up-regulation of the IRF-9 component of ISGF-3 during differentiation was a critical regulator of the IFN response. Importantly, M. tuberculosis infection of PMA-treated THP-1 cells led to secretion of type I IFN. This probably accounts entirely for the observed activation of ISGF-3, since no other activator is known. However, alternative mechanisms cannot be formally ruled out. The ability to produce ISGF-3 was associated with suppressed HIV-1 replication and induction of an inhibitory C/EBPβ transcription factor after an inflammatory stimulus. In the absence of IRF-9, monocytes may not be able to counter the proinflammatory effect of M. tuberculosis infection on HIV-1 replication. In vitro infection of primary macrophages or the model PMA-treated THP-1 cells with M. tuberculosis did not reproduce the state of activation observed in alveolar macrophages during the cellular immune response to active tuberculosis. Macrophages in lung segments involved with tuberculosis lose C/EBPβ expression, express another C/EBP site-binding activity, and support high level HIV-1 replication (4, 5, 15). As expected, PMA-treated THP-1 cells or primary macrophages infected in vitro with M. tuberculosis exhibited a type I IFN response characteristic of resting alveolar macrophages, which strongly expressed the inhibitory C/EBPβ and suppressed HIV-1 replication (15). The interaction of C/EBP transcription factors with the LTR is particularly important for control of viral replication in macrophages. Mutation of the C/EBP sites in the LTR produces a virus that continues to replicate in lymphocytes, but is no longer able to replicate in macrophages (21). Monocytic THP-1 cells and primary monocytes are able to up-regulate HIV-1 replication after infection with M. tuberculosis or stimulation with LPS (11, 22). The enhancing effects of proinflammatory stimuli require intact C/EBP and NF-κB sites in the HIV-1 LTR (6, 7). Surprisingly, the opposite effect was observed when THP-1 cells were differentiated to macrophage-like cells by PMA treatment. Repression requires intact C/EBP sites and is associated with induction of an inhibitory 16-kDa C/EBPβ (15, 22). In the present study primary monocytes differentiated to macrophages by M-CSF also suppressed HIV-1 replication after infection with mycobacteria and were able to induce the inhibitory C/EBPβ. Therefore, THP-1 cells are an appropriate model for investigating the mechanisms underlying the production of transcriptional repressors during an IFN response. After infection with M. tuberculosis, monocyte-like THP-1 cells induced only stimulatory 37-kDa C/EBPβ. In contrast, infection of PMA-treated THP-1 cells or primary macrophages also induced a dominant-negative 16-kDa C/EBPβ transcription factor. This result is at most partly due to an autocrine response to type I IFN, since IFN-independent mechanisms can also lead to induction of 16-kDa C/EBPβ in macrophages (M. Weida and N. Tanaka, unpublished observations). Thus, differentiation enables the cell to produce short form C/EBPβ either by regulating translation start site utilization during protein synthesis or by inducing a protease (24, 26, 27, 28). Both stimulatory and inhibitory C/EBPβ isoforms were expressed in macrophages, but repression occurred because the 16-kDa C/EBPβ is a dominant negative factor that represses transcription when expressed at 20% the level of the stimulatory 37-kDa C/EBPβ (24). Expression of the inhibitory C/EBPβ represses promoters containing C/EBP sites such as the HIV-1 LTR (6) and also disrupts the function of the ubiquitously expressed serum response factor (55). Therefore, cells that express high levels of inhibitory C/EBPβ may have global inhibition of multiple promoters. Modulation of C/EBPβ expression by differentiation is likely to have a profound effect on viral replication and expression of proinflammatory genes. The dominant negative C/EBPβ transcription factor was induced by type I IFN in THP-1 cells only if they were first treated with PMA. Since without PMA treatment, THP-1 cells also fail to produce ISGF-3 after IFN stimulation, a possible explanation for the failure to alter C/EBPβ expression in the monocyte-like cells after IFN stimulation is that ISRE-mediated transcription is required, either directly or indirectly, to up-regulate inhibitory C/EBPβ expression. The IFN-induced transcriptional repressor would inhibit viral replication only after the provirus had integrated into genomic DNA. The observation that type I IFNs or proinflammatory stimuli such as LPS inhibit viral replication at a stage of the viral life cycle before viral integration (56, 57, 58) supports the idea that IFNs can protect both monocytes and macrophages from viral infection at a stage before LTR promoter function is required. Macrophages, however, gain the ability to inhibit LTR-mediated transcription after type I IFN stimulation. The induction of inhibitory transcription factors by IFNs is therefore particularly important for the production of latent infection and may provide a selective advantage to the virus by creating a reservoir of infected macrophages able to avoid destruction by HIV-1-specific cytolytic T cells. Only PMA-treated, macrophage-like THP-1 cells or alveolar macrophages had significant activation of ISGF-3, the type I IFN-specific transcription factor complex, in response to type I IFN stimulation or mycobacterial infection. This was associated with increased IRF-9 activity in both the cell line and primary macrophages. Infection with M. tuberculosis did not up-regulate IRF-9 expression in primary monocytes. This probably contributes to their inability to control HIV-1 replication after M. tuberculosis infection. Regulation of the abundance of IRF-9 is an important mechanism for modulating IFN responsiveness (59). Further support for this conclusion comes from the observations that induction of ISGF-3 in undifferentiated monocytic cell lines is delayed and requires protein synthesis (60), while cells differentiated with PMA or all-trans-retinoic acid have increased levels of IRF-9 and exhibit rapid activation of ISGF-3 after IFN stimulation without the need for protein synthesis (38, 39). The molecular role of IRF-9 in formation of ISGF-3 has functional significance, since transfection of IRF-9 into IRF-9-deficient cells restores the antiviral response to type I IFN (61). The fact that differentiation did not alter the transcription rate of the IRF-9 gene while both mRNA and protein abundance were increased demonstrates that the effect of differentiation on IRF-9 levels is post-transcriptionally mediated. Furthermore, induction of IRF-9 by type I IFN was post-transcriptionally regulated in THP-1 cells both before and after PMA treatment. Insufficient IRF-9 may account for the inability of monocyte-like THP-1 cells to form ISGF-3, since the addition of IRF-9 to extracts of type I IFN-treated cells reconstituted ISGF-3. The ability to reconstitute ISGF-3 with IRF-9 shows that both latent STAT-1 and STAT-2 were activated by type I IFN in monocyte-like and macrophage-like cells. These results are consistent with the observation that JAK-1 and TYK-2, the enzymes responsible for STAT-1 and STAT-2 phosphorylation in response to type I IFN, are activated after IFN stimulation of undifferentiated THP-1 cells (62). Further, at least in fibroblastic cells, STAT-2 phosphorylation is required for activation of STAT-1 and formation of STAT-1 homodimers in response to type I IFN (63, 64, 65). Thus, THP-1 cells have intact signal transduction through the type I IFN receptor. Infection does not lead to formation of STAT-1 homodimers in THP-1 cells before or after PMA treatment, even though in both cases they are able to respond to type I IFN stimulation by formation of STAT-1 homodimers and induction of STAT-1 transcription. Moreover, proinflammatory stimuli induce autocrine type I IFN in both monocytes and macrophages (14, 15). Infection may up-regulate any of the mechanisms known to limit activation or DNA-binding activity of STAT-1. First, suppressor of cytokine signaling-1 inhibits the activation of JAK-1 and TYK-2, thereby limiting activation of STAT-1 in response to type I IFN (45, 46). Second, protein inhibitor of activated STAT-1 can block the DNA-binding activity of STAT-1 homodimers. The differential effects of these two mechanisms on the STAT-1 homodimer/ISGF-3 ratio is unknown. Third, src homology domain 2 containing protein tyrosine phosphatase limits accumulation of tyrosine-phosphorylated STAT-1, thus reducing formation of STAT-1 homodimers relative to that of ISGF-3 (40, 44). It is also possible that differentiation or infection may modulate the serine kinase ERK2 or the tyrosine phosphatase protein tyrosine phosphatase-1D systems, which play a role in forming functional ISGF-3 (41, 42). The most likely explanation for the failure to produce STAT-1 homodimers after infection, however, is the dose-response characteristics of the type I IFN system. STAT-1 homodimers were observed after stimulation of THP-1 cells with 100 U/ml of IFN-β or 500 U/ml of IFN-α, but not after stimulation with 10 U/ml of IFN-β or 50 U/ml of IFN-α (R. Pine and A. Canova, unpublished observations) before or after PMA treatment. M. tuberculosis induced less ISGF-3 than 500 U/ml of IFN-α. Taken together, these data suggest that M. tuberculosis infection produces relatively low levels of type I IFN, inducing ISGF-3 if sufficient IRF-9 is present, but not STAT-1 homodimer. Before or after PMA treatment, THP-1 cells activated NF-κB to a similar extent in response to a proinflammatory stimulus. Thus, the difference in M. tuberculosis uptake did not significantly alter the extent of cellular activation in either culture. The NF-κB family of proteins is essential for activating type I IFN production after viral infection (66). Despite this fundamental response to infection, the set of genes activated by the innate immune response depends on the state of cellular differentiation. Further, the high level expression of NF-κB when the LTR is repressed suggests that inhibitory C/EBPβ is dominant over the stimulatory effects of NF-κB. This finding reinforces the idea that the LTR is repressed by strong expression of the inhibitory C/EBPβ until the cellular immune response activates the alveolar macrophage. In patients with pulmonary tuberculosis, the level of inhibitory C/EBPβ is reduced when high levels of LTR promoter activity are expressed (15). Therefore, derepression may be needed before promoters containing C/EBP sites can achieve high levels of expression in tissue macrophages. Expression of the inhibitory C/EBPβ would have the effect of preventing high levels of proinflammatory cytokine production in the lung due to activation of NF-κB or through other mechanisms after a brief inhalation of environmental LPS or other proinflammatory stimuli. The regulation of HIV-1 replication in monocytes and macrophages bears a striking similarity to expression of proinflammatory cytokines, such as IL-6 and TNF-α. The high degree of correlation between HIV-1 production in the lung during tuberculosis and the levels of TNF-α and IL-6 may indicate coordinate regulation of cytokine promoters and the HIV-1 LTR (4). The promoters of TNF-α and IL-6 share C/EBP and NF-κB transcription factor binding sites with the LTR (67). The TNF-α promoter, like the HIV-1 LTR, is strongly repressed by engineered expression of the inhibitory C/EBPβ in monocytes (68). C/EBPβ knockout mice, but not mice deficient in both IL-6 and C/EBPβ, develop a lymphoproliferative disease associated with high levels of IL-6 (69, 70), suggesting that C/EBPβ is an important negative regulator of IL-6 production in vivo. Finally, aerosolized IFN-α inhibits IL-6 and TNF-α production in the lungs of patients with tuberculosis (71). Thus, the innate immune response to proinflammatory stimuli should have similar effects on cytokine production and LTR function. The inclusion of C/EBP sites in the HIV-1 LTR may be another example of HIV-1 usurping normal immune regulation for its own advantage. Pathways that inhibit cytokine production may also promote viral latency, protecting provirally infected macrophages from immune surveillance. Alternately, up-regulation of viral replication by the same transcription factors that up-regulate proinflammatory cytokines during pulmonary tuberculosis leads to enhanced viral production in the context of opportunistic infections. Alteration of C/EBP expression may underlie many circumstances in which immune system activation is associated with enhanced viral production. An improved understanding of the interaction of C/EBP transcription factors and the IFN system may contribute to our ability to blunt the enhanced HIV-1 replication observed in macrophages during opportunistic infection. We thank Jan Vilcek for providing neutralizing antisera against type I IFNs. ↵1 This work was supported by National Institutes of Health Grants AI37877, MO1RR00096, and HL57879; the American Lung Association; the Japan Foundation for AIDS Prevention; the Arthritis Foundation; and Fred Friedman. ↵3 Abbreviations used in this paper: LTR, long terminal repeat; C/EBP, CCAAT/enhancer binding protein; GAS, IFN-γ-activated site; HAART, highly active antiretroviral therapy; IRF, IFN regulatory factor; ISGF-3, IFN-stimulated gene factor-3; ISRE, IFN-stimulated response element; MOI, multiplicity of infection; VSV, vesicular stomatitis virus.